It was my birthday on Monday, and one of my ways of celebrating was to pick the first of the season's Purple Sprouting Broccoli to have with our dinner. It was only a few spears, but since this is one of my favourite vegetables, it certainly did qualify as a special treat! This first batch was from my "Rudolph" plant. To be honest, I don't think the different varieties have noticeably different flavours though. To me they all seem equally good! In the past I have grown White Sprouting Broccoli ("White Eye") and I found it to be a lot stronger in flavour than its purple cousins - it had a very "brassica-ey" taste, if you know what I mean, more along the lines of Brussels Sprouts, and I know that doesn't appeal to everyone. I'm hoping that with my 3 plants being of 3 different varieties I will be able to pick batches of spears for much longer than would be the case if they were all of the same type. 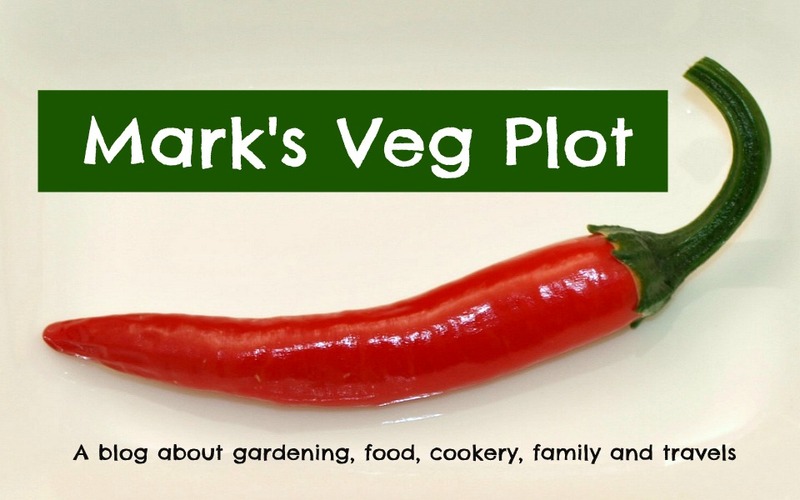 With a bit of luck my harvest period will last until about the end of April, or possibly later, by which time I'll need to start thinking about sowing next year's crop! Shouldn't Rudolph be the red one? At least this year I don't just have to look enviously at your PSB. Hi Lauren; I have no problem with that link of yours - thanks for the additional publicity! BTW, we don't get to use the outdoor eating area very much, due to the "variable" British weather! It's a nice place to sip a cool glass of wine on a warm Summer evening though.